Have Employers' Minimum Wage Concerns Fallen on Deaf Ears? A non-for-profit Ontario association representing the hospitality industry dating back to the 1920’s. We are Canada’s largest provincial hospitality association representing over 11,000 businesses. We represent the industry’s interests at both the Provincial and Municipal levels of Government. We are diligent and involved on the grassroots level. We are driven to go the extra mile in supporting and gaining industry success. We have proven impact and are relentless in not giving up. We operate within a top service culture for one stop expertise on regulatory inquiries. ORHMA is a key stakeholder with various government files including tourism, environment, energy, health, finance, labour, AGCO and economic development. Recent years have not been kind to Ontario’s business community as it has been a tough climate for all involved. ORHMA has focused on supporting Ontario’s hospitality industry through education and alternative cost reduction options among favourably shaping tough legislation on behalf of our sector. ORHMA has been involved right from the beginning with the Ministry of Labour and the Premier’s office in recommending changes to unfair onerous amendments to the Employment Standards Act and Labour Relations Act. When Bill 148 was repealed, the PC government chose ORHMA to represent Ontario’s hospitality industry at the legislature’s committee hearings and the question-and-answer session to defend amendment changes in their media event launching Bill 47 the Making Ontario Open for Business Act. ORHMA has been a dependable and influential stakeholder among our business coalition that met with WSIB’s leadership impacting future reductions in WSIB premiums. Through our advocacy, the hotel and accommodation industry will see reductions of 29.8 per cent and food and beverage establishments will see reductions of 31.6 per cent in 2019. ORHMA in partnership with the Hotel Association of Canada (HAC), released a best practices guideline for regulating short-term accommodation rentals. Governments at all levels are grappling with the implications of the growing short-term rental industry and platforms such as Airbnb. This guideline gives Canadian municipalities an analysis of regulatory developments worldwide and best practice approaches to developing a local framework. The short-term rental industry operates with limited regulation and online platforms are being used to operate commercial accommodation businesses, resulting in unintended consequences which includes lost tax revenues, less housing, community nuisances and even criminal activity. There is a serious need for federal, provincial, and municipal governments to consider putting a modern regulatory framework in place that will address these consequences, promote fairness and protect communities. When a private members bill was introduced to prohibit the “house” from various tip sharing practices, ORHMA was the initial organization strongly opposing it and continued to be involved with the Ministry of Labour winning fair amendments in tipping practices. ORHMA was specifically responsible for the protection of the “house-portion” of automatic tips in banquets and through our industry study we were successful to allow foodservice operations to keep the cost of credit card fees applied to charges. 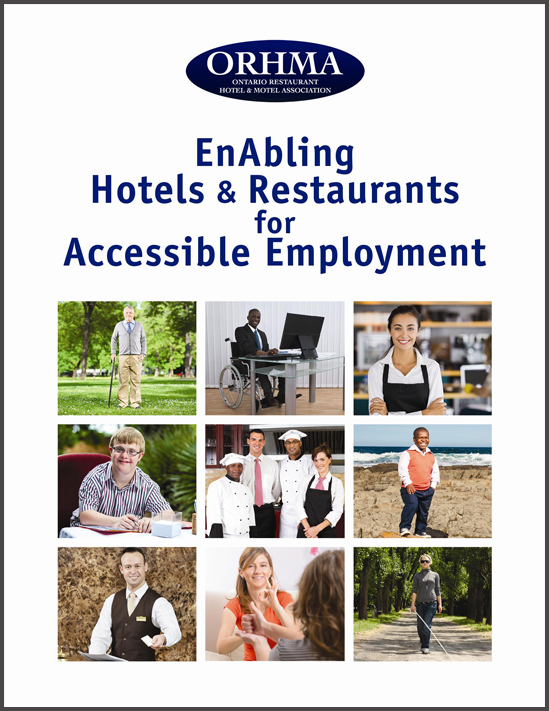 ORHMA continues to be the hospitality lead on AODA supporting total inclusion in our industry and society while ensuring fair business implementation such as successfully advocating for an exemption to existing properties from the AODA build standards unless major renovations occur. ORHMA members have been loud and clear regarding the outrageous rate increases for their Tourism Oriented Directional Signage (TODS). The imposed increases created havoc and anger in the industry with unprecedented or warranted increases for tourism signage. Through advocacy and communications with the Ministry of Tourism, Culture and Sport and the Ministry of Transportation, it has been announced that all price increases for 2019 will be frozen. ORHMA will continue to work with government and are pleased that this price freeze will provide some relief to the establishments in the hospitality industry who participate in this program. Federal Government of Canada announced that it has helped secure new, separate and voluntary commitments from three payment card networks that will lead to lower costs for small and medium-sized businesses — changes largely championed by the Small Business Matters (SBM) Coalition, which ORHMA has been an active member of, representing and advocating for the hospitality industry in Ontario. Our members have voiced their concerns of paying high credit card interchange fees, in conjunction with many other hefty operating costs, therefore ORHMA was committed to lobby, with the SBM Coalition, for some relief for small and medium sized-businesses. Merchant fees (swipe fees) charged to Canada's small businesses when they process customer transactions paid by credit cards are amongst the highest in the world—ranging from 1.5% to 4% of a purchase. Particularly for small business, these costs constrain their ability to invest in their businesses, their ability to hire new employees and result in increased consumer prices, even for those consumers paying by cash or debit. La Rocca Creative Cakes Inc.